ATLANTA (April 26, 2017) – Rose Hill, at Lockerly Arboretum, has been listed in the National Register of Historic Places. The property is located at 1534 Irwinton Road in Milledgeville (Baldwin County). The nomination and materials were sponsored by the Lockerly Arboretum Foundation. Rose Hill was listed in the National Register of Historic Places as an excellent and intact example of the Greek Revival style and the Georgian house type in Baldwin County. 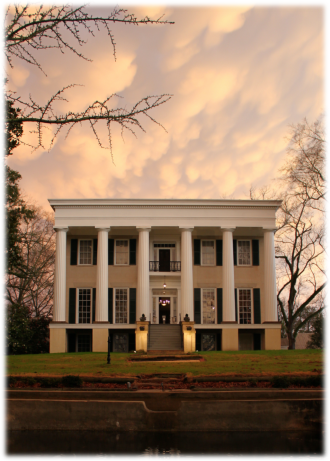 The Greek Revival style was the first architectural style to appear statewide in Georgia, and while the style is expressed through many variations, Rose Hill embodies almost all of its identifying features. The two-story house’s stucco clad exterior, prominent columns supporting a full-width porch, the wide plain entablature, heavy proportions, symmetrical front façade, low-pitched hipped roof, and double-hung six-over- six windows are all indicative of the style. Rose Hill also exemplifies the Georgian house type through its two-story, square-shaped plan with a central hallway flanked by pairs of rooms and four interior chimneys. The house retains a high degree of exterior and interior integrity, with the last significant changes occurring in 1963, when bathrooms were added within each of the upstairs bedrooms. Historic interior materials include plaster walls, hardwood floors, pocket doors, mahogany doors, and marble and wooden mantels. Stairs and baseboards feature faux marbling, while most door and window surrounds have faux graining. Several of the associated outbuildings and structures are good examples of household ancillary resources, such as the vegetable crib, pit garden, and koi pond. Rose Hill was built in 1852 by Judge Daniel R. Tucker, was used as a private residence and, later, as a corporate guest house until 1998. The Lockerly Arboretum Foundation purchased the 2.57-acre parcel encompassing the house in 1998 for use as an educational facility and house museum. The National Register of Historic Places is our country&apos;s official list of historic buildings, structures, sites, objects, and districts worthy of preservation. The National Register provides formal recognition of a property&apos;s architectural, historical, or archaeological significance. It also identifies historic properties for planning purposes, and insures that these properties will be considered in the planning of state or federally assisted projects. National Register listing encourages preservation of historic properties through public awareness, federal and state tax incentives, and grants. Listing in the National Register does not place obligations or restrictions on the use, treatment, transfer, or disposition of private property. Contact: For press inquiries regarding Historic Preservation Division contact Public Affairs Coordinator Jeff Harrison at (770) 389-7869 or jeff.harrison@dnr.ga.gov. For information regarding Rose Hill and Lockerly Arboretum contact Jennifer N. Pollard, Executive Director at (478) 452- 2112 or jenniferpollard@lockerly.org.